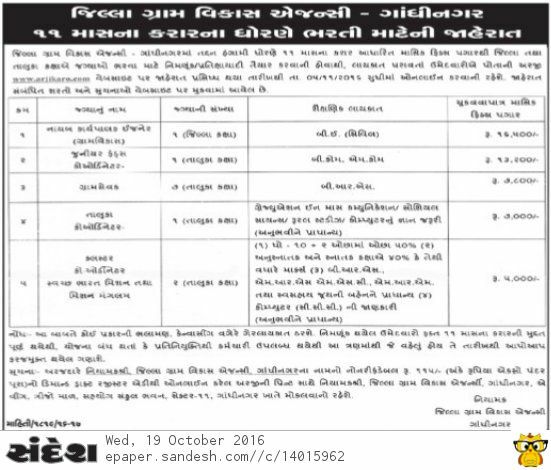 Gandhinagar Jilla Gram Vikas Kacheri invites online application for various post. Interested candidates may apply online application through official website www.arjikaro.com before last date 05.11.2016. Candidates are advised to read full advertisement and notification before apply online. More details like post name, educational qualification, age limit, application fee, selection process and how to apply are available at DRDA Gandhinagar Recruitment Notification link given below. 0 Response to "DRDA Gandhinagar Bharti 2016 at www.arjikaro.com"